What Is DA Form 3644? DA Form 3644, Monthly Abstract of Issues of Petroleum Products and Operating Supplies is a form used for recording monthly issues and receipts of fuel and operating supplies. The report is a part of the Army's efforts to seamlessly interconnect capitalized and non-capitalized fuel accounts. An updated version of the form is distributed in excel with embedded calculations and can be supplied through the USAPC. The new version of the form - often incorrectly referred to as the DD Form 3644 - was released by the Department of the Army (DA) in April 1985. A PDF DA Form 3644 fillable version is available for download below or can be found through the Army Publishing Directorate website. Daily issues of petroleum are recorded on the DA Form 3643, Daily Issues of Petroleum Products, released by the DA in April 1985. At the end of each month, the data from the daily reports are used to prepare the monthly DD 3644. How To Fill Out Da Form 3644? Insert type, grade and unit of issue for each product issued (e.g., engine oil, OE30, quart). To convert oil, lubricating, divide total quarts by 4. To convert gear lube to gallons, divide total pounds by 7½. EDITION OF 1 OCT 70 MAY BE USED. The top lines of the form require the name of the station, post or camp where the issues and receipts are recorded followed by the month and year and voucher number from the unit document register. Columns A through M require the total daily issues and receipts for each product (as recorded on the DA 3643). The amounts in every column are totaled and converted to gallons after all entries are transferred to the DA 3644. The accountable office should provide their signature and grade in the corresponding boxes. 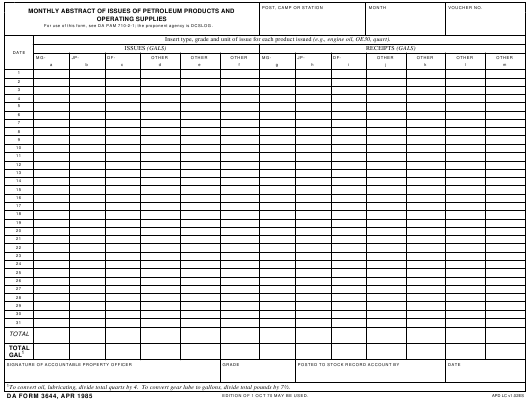 The final lines of the form require the signature on the employee posting the information to the MBPS (Monthly Bulk Petroleum Accounting Summary) and the date of posting.